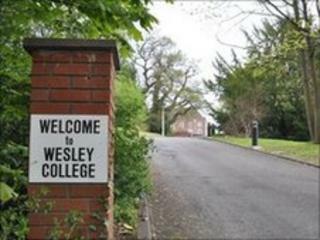 The Wesley College for Methodist training and education in Bristol is to close, despite a campaign to keep it open. The Methodist Conference decided there were not enough students to warrant such a large institution. But it said all current students at the college in Henbury Hill would be able to finish their studies there. Campaigners against the closure said the college was still educating almost 100 lay people. Charity Hamilton, one of more than 400 people who campaigned to keep the college open, said that in 2007 the Methodist Conference decided it would not be one of three colleges in the UK to train full-time ministerial students. "This was accepted and they asked us to diversify into training lay people," she said. "They keep bandying around these figures of only three students when actually there are nearly 100 students, it's just that only three of them are training for the ministry." Reverend Mark Wakelin, from the British Methodist Church, said: "It's a great college and I think the conference is very sad to close it down." But he added: "It's a very large estate with a lot of accommodation and it's not needed for an institution which is training mostly lay people. "They have had no full-time students from 2007, and three part-time students training for the Methodist ministry. "It came out of a very intense review that basically the college relied upon a large amount of buildings, to let and do commercial things with, to subsidise it. "I think conference took the mind that wasn't the best use of national property, to subsidise a local training programme."